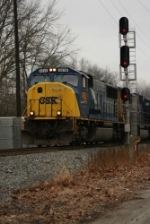 Description: CSX SD70MAC 4503 trails on Q275 South. Description: CSX Q241-17 pulls out of the siding after meeting a CF&E Z-861 just north of Lima. Description: Q241-17 pulls out of the siding at Cairo just north of Lima after making a meet with I&O Z-861 on the CSX Toledo Sub. Description: Q241-17 begins to pull out of the siding at Cairo on the CSX Toledo Sub just after meeting a I&O Z-861. Title: CSX U308 in the " Sweetlight "
Description: AFter almost this engine it great to get picture of it. Description: Due to the diamond replacement at CP 16 Q393 ran down the Lakefront Line and over the NS between Drawbridge and Berea. Description: ES44DC #5331 and an SD70MAC lead a manifest (symbol unknown) train onto the Old Main Line Subdivision. Description: Eastbound with one GE and five EMD models. Description: This unit coil train had these two pushers. Description: P&L Transportation has recently acquired sixteen SD70MAC's from CSX for use on the PAL/EVWR/A&O system. Here we find PAL 2120/2117 leading the 2nd batch of eight MAC's through Vine Grove during their southward trip to Paducah.